TEXAS ROADHOUSE: The Original @TexasRoadhouse Experience now in Manila! 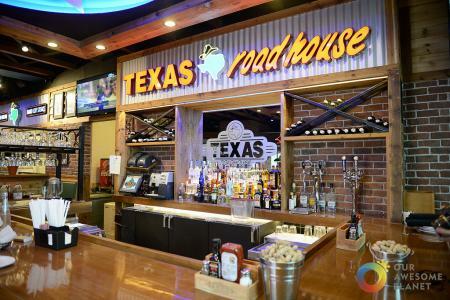 Texas Roadhouse Manila is the first Southeast Asian franchise (second next to Taiwan in Asia) of the popular western steak and ribs concept founded in Indiana in 1993. They're famous for their hand-cut steaks, fall-off-the-bone ribs, made-from-scratch sides, fresh-baked bread, and the legendary margarita. Watch The Original Texas Roadhouse Experience. The moment you enter the restaurant you are greeted with happy servers and high-energy country music. The branch is decorated with elements typical of a roadhouse--Native American murals, neon signs, western red cider timber, stuffed animals, and galvanized metal. They have a fully functioning bar perfect for sports enthusiasts who can watch on the LCD screens from their seats. The bestsellers are the draft beers and legendary margaritas. The restaurant is 500 sqm including the outdoor sitting area with a capacity of 300 guests. The aisles in between the tables are a bit narrow but add to the quaint ambiance.